Baltimore City will be forced to refunds or void over a thousand speed camera tickets after WBFF Baltimore News revealed that the cameras had been configured to issue tickets for the wrong speed limit. Two motorists who received citations from one camera located at 2800 S Hanover Street Northbound, Near the Harbor Street Bridget citing them for driving more than 12mph over the speed limit in a 30mph Zone. While most motorists who received the citations paid them without question, these two realized the posed speed limit on Hanover Street was in fact 35mph, not 30mph, and in fact the tickets were in error. One of the motorists took a video of the stretch of road, showing 35mph speed limit signs both before and after the speed camera location, not 30mph which the citations were based on. Both motorists contacted WBFF news about their tickets. After a reporter confronted the city with the errors, the city admitted that 998 motorists were wrongly cited. WBFF also REPORTED that a SECOND camera, located at 5400 The Alameda, was ALSO incorrectly configured to the wrong speed limit. 190 motorists were incorrectly tickets by that camera. Baltimore has since agreed to issue refunds. A representative of Baltimore City claimed that they have "three tiers of checks in place to prevent this from happening", and that errors are relatively rare. The erroneous citations from these cameras had apparently slipped through the 'three tiers of checks' since January. 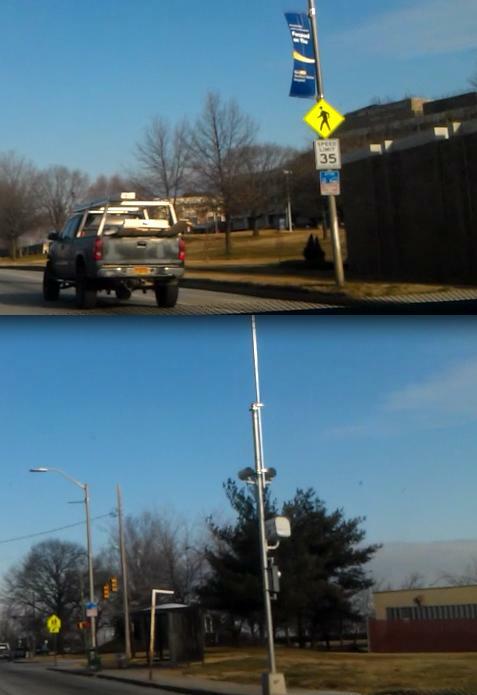 Baltimore City made a similar error in the past, where in 2010 a camera located at 2200 West Cold Spring Lane issued 932 tickets in error, after being set to enforce the wrong speed limit. Baltimore recently was discovered to have issued a tickets to a motorist who had been deceased for years. In another instance one motorst took seven months to clear a citation from his record which Baltimore City issued to the wrong car by mistake. In a separate incident, Baltimore City was discovered to have issued 2000 red light camera citations which had been "signed" by a police officer who had been dead for months. Baltimore City is one of the jurisdictions who testified in favor of legislation which would remove the requirement that speed camera citations be reviewed by police, allowing private contractors to "sign off" on them instead. Baltimore is also seeking legislation which would authorize an entirely new type of photo enforcement system, which would issue fines of up to $500 to large vehicles. Both bills were approved by a legislative committee last week and are expected to be voted on in state senate soon. On the other hand, another bill would require cameras to meet national standards for accuracy and certification instead, is scheduled to be heard by a house committee this week. StopBigBrotherMD had previously learned that as of early 2010 some cameras in Baltimore did not meet a requirement that they be "certified" by an "independent calibration laboratory", and were instead merely "certified" by the manufacturer of the device. The proposed bill, which some municipalities who use inaccurate cameras are likely to oppose, would ban this.